It was a 5.30 pm kick off that beckoned today but things got off to a bad start when the coaches didn’t turn up on times due to a mix up. I was on coach two today but as coach one got ready to go with our driver from last week, there were reminisces from then when it wouldn’t go! Eventually it did so instead of leaving at 12.00pm we were at least 40 minutes late. Our pub stop in Sutton Coldfield was reduced to 90 minutes where Worksop and Harrogate Whites stopped too. It was a long time since I’d visited the Hawthorns and can’t really remember when I was last there. Games I can remember were Johnny Giles’s testimonial game and also Telford in the FA Cup. I wasn’t there when we were relegated as for two years I only went to home games due to having my first two children. What I can remember though from our early visits, were scores of Leeds fans getting arrested for nothing. Even when we scored and were cheering when we scored a goal, that was the excuse to wade into our fans on the terraces and drag anyone out. 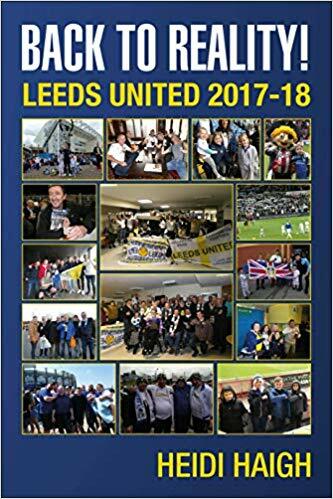 One thing that happened this week corroborated one of my stories in my first book Follow Me and Leeds United. A newspaper cutting shared on my timeline from John Murgatroyd in Harrogate confirmed what I’d written in the book. As I’ve said many a time, everything I’ve written about is true, there is nothing made up and even though it has taken 47 years for it to be confirmed, I wasn’t far off! We got to the ground in plenty of time for kick off, but as there was no space for my flag as they wouldn’t let Leeds fans put them at the front due to advertising rights, I left mine in my bag. Before the game started and with the 100th anniversary of the end of the First World War tomorrow, saw the Last Post played and an immaculately observed minute’s silence take place. The team: Peacock-Farrell, Dallas, Alioski, Cooper, Jansson, Douglas, Phillips, Klich, Roofe, Forshaw and Hernandez. Subs were: Roberts for Roofe (66), Harrison for Douglas (73), and Saiz for Klich (78). Attendance was 25,661 with 2,737 Leeds fans. Leeds lost the game 4-1 with Hernandez scoring a late consolation goal (90+2). I didn’t know what to expect from the game as I didn’t know anything about them apart from them getting relegated last season, including forgetting that Bartley now played for them. As they mentioned he was out injured the realisation hit me. We were under the cosh from the word go so I knew we weren’t in for an easy game and expected them to raise their game as they were playing us. We had a few narrow escapes and Peacock-Farrell was forced into making a good save to stop them from scoring. We had plenty of possession but we didn’t actually do anything with it. No one seemed to want to take charge in midfield and I know we try patient build ups but we kept giving silly passes away and that gave WBA the impetus to attack us. I was happy to get to half time with the score 0-0 and it ended up with the Leeds fans still singing and it being very quiet from the home fans. I went downstairs at half time as I was hoping to see the Thames Valley Whites with their new flag which was a tribute to the fallen and Armistice Day but sadly I never found them. Speaking to a friend of mine at half time, she said beware of the pavements around West Brom as they jump up and hit you in the face! Things got quite scary as we were trying to get back to our seats at the end of half time. Stewards were blocking the tops of the stairs and wouldn’t let anyone back up in to the stand. As more and more fans came up behind us and we started to get crushed things could so easily have got out of hand with things kicking off when there was no need at all. Luckily they soon saw sense and let us up but that was stupid and irresponsible. It turned out to be a tale of two halves because within six minutes we were a goal down. From having a penalty appeal turned down, the ball ended up with their player taking on two of ours who hesitated, looking for an offside flag. This was when I realised how strong and big some of their players were. Unfortunately they went on to score. What we had been doing was trying to walk the ball into the net instead of shooting which meant we had very few on target. We did get into a couple of good positions but our shots were wide. For those fans involved, keeping the ball is counterproductive especially as we were losing. Within a few minutes from this, with misplaced passes from us and WBA getting the rub of the green with the ball running in their favour more often than not, they scored again. It did look like Peacock-Farrell was going to save it but unfortunately it looked to go through his hands for their second. I still thought we could get something from the game at that point even though we didn’t really look like scoring. When the ball ricocheted off one of our players straight to theirs to run on and score it was game over. It wasn’t the end though as WBA got a 4th and we were down and out! With that, the Leeds fans came into their own once again and showed what makes me love our support. Those left behind did a great rendition of “We all love Leeds”, over and over again which made Hernandez chip the ball over their goalie to pull one back although too little, too late. As the Leeds fans carried on with the song even after the final whistle, it meant some of our players come straight over to clap us all. As always I’m proud to be a Leeds fan. As I came down the steps and met my daughter Dani she said when Hernandez scored, she was the only one where her seat was just behind the goal, as gaps had appeared all around her when their fourth went in. There was something kicking off downstairs with the police surrounding some Leeds fans and one lad in particular. Eventually it looked like things had calmed down as he walked past us but then no end of coppers followed him as we carried on past. As we got to the bottom of the walkway and ready to cross the road, some police were getting high and mighty with some Leeds fans although I’d not seen or heard anything out of order. I tried to diffuse the situation for some lads and one said it was his brother with them but the police were being heavy handed when there was no need. I got the lad away and I know he was angry about being pushed around and wanted the number of the one who had pushed him. Unfortunately knowing how bad they could be down there I said it wasn’t worth him getting done for it no matter how angry he was. He did thank us though. Someone said they knew what was wrong with Leeds; too much breast feeding although I think sleepless nights would be true! I had to laugh at that because with four or five new born babies within the last few weeks, our players’ wives did all the work to begin with! I had some fans blaming Peacock-Farrell for letting the goals in though, but I didn’t agree. Maybe he should have got the second but it was individual errors and bad passing further up the field that caused them to counter attack us. Our failings of not shooting further out and trying to walk the ball into the net proved costly to me today. Hearing Mick Hewitt had taken one of his branch members to hospital today, I hope they are okay and get well soon. Back to the drawing board for us today and back to reality as we were shown a lesson in that second half. Men against the boys, but ex premiership money showing. Whilst I don’t want to go back to silly money for players, there was nobody on the bench who was going to come on and be a match for them in those stakes. With another international break upon us there is no game next week before we return to Elland Road for the Bristol City game. With the rugby game at Elland Road tomorrow, I only hope they don’t damage the pitch and that is one reason why I don’t like having their games at our ground. Thank you to Jan, Carl, Daniel, Daz and The Masons for buying my new book Back to Reality. Your support is appreciated plus a thank you to those of you who took the time to say you enjoy reading my books and my blog. Speaking of my blog, to hear it has gone as far as China courtesy of Charley from Harrogate, is good to hear and again thanks to him and anyone else who shares my blogs with others. See you against Bristol – LUFC – Marching on Together!